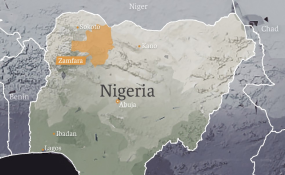 In Nigeria's state of Zamfara, villages are regularly attacked by armed gangs. Hundreds of people have died and thousands are fleeing as they no longer feel safe. Why is the government not taking action? Rakiya Bala and her youngest child are standing in front of the hospital in Tsafe, a county in the state of Zamfara in north-western Nigeria. She is one of the many visitors who have crowded into the wards this morning. Her husband is lying in one of the beds. He is one of the latest victims of the attacks now carried out daily by bandits. A few days ago bandits had approached their home village. "The local militia informed my husband that they wanted to chase the bandits away," she says. Her husband, a member of the parastatal unit, responded to the call. But instead of fleeing, the bandits opened fire. "He was injured," says Bala, the mother of three small children. Other villagers standing close by tell how their brothers, husbands or fathers were shot or even killed. The attacks have become part of everyday life in Zamfara, a rural state. Only two days after the attack in Tsafe, a kidnapping on the road towards Katsina was reported. According to the Nigerian daily Daily Trust, at least 80 people were killed in December alone. According to Zamfara's emergency authority ZEMA, 30,000 people have left their homes because of the violence and are now living in refugee camps or in host communities. There are only about 3,000 police officers to provide security throughout the state, which has an estimated population of between 3 and 4.5 million people. But even with more security forces, the problem of raids would not be solved automatically, police commissioner Mohammed Ibrahim Zanna says. "Nothing is enough in life, even if we have 10,000 police officers. Without a strategic structure and security architecture, we won't be able to surmount these challenges." He rejects the criticism that the police are not present in rural communities. But those who drive overland - for example in the direction of the neighboring state of Katsina - do not see a single checkpoint on the long road. There are just a few policemen in the villages along the way. For Adamu Abubakar Kotorkoshi, who heads the Center for Community Excellence in Gusau, the provincial capital, security does not only depend on the number of police officers and their equipment. "We have to accept that there is a problem," he says. Until a few years ago, Zamfara was a peaceful federal state. Then there were riots and minor conflicts between farmers and pastoralists. Gangs began stealing cattle. Now, residents are often kidnapped during the raids to extort ransom money. Those who resist are shot. The spiral of violence has tightened. Kotorkoshi demands a swift change to the style of leadership of the provincial government under Governor Abdulaziz Yari, who is no longer up for election, as well as by the government of President Muhammadu Buhari "You have to sit down and look for longterm solutions, otherwise the crisis will never end," he says. Like many people in Zamfara, he believes that the bandits come from the region. "Some of the people are known, they are part of the community. So we need to identify the people and know why they are doing it. Is it poverty? Unemployment? Definitely there must be a reason behind that. Once the reasons have been identified, we can also talk about a possible amnesty program." The government has confirmed that there is information about the perpetrators. "We have eight to ten camps where the bandits hide," says State Secretary Abdullahi Shinkafi of Zamfara's state government. "There are probably around a thousand bandits in each of them. That's one aspect we have to take care of." When asked why there is no offensive against the camps, he admits that there are too few security personnel. Salisu Musa Tsafe, a member of the national parliament for Buhari's ruling All Progressive Congress (APC), also complains. There are many bandits, he says. "Sometimes they've come in their thousands." But he doesn't think that the difficult security situation will affect the presidential election in February, or that Buhari could be voted out of office. "It all began before the president took office. He is doing everything he can to ensure that every Nigerian can live in peace here." Young mother Rakiya Bala does not want to get involved in political discussions. The woman who earns her living in the fields and as a cook has no choice. No matter how intense the attacks become, she has to go back to her village. "Even if I am afraid, I have to go back. My children are still there."